8) And Finally: Is A Shale-Sized Oil Boom Hiding In Britain’s Atlantic Bedrock? More onerous targets are in place for 2030, with a 30pc drop required….. The State faces paying a €100m bill in just over two years' time for failing to meet legally binding climate change targets. Failure to reduce greenhouse gas emissions by a 2020 deadline is expected to incur a bill ranging from €6m to €13m, while a shortfall in achieving renewable energy targets could cost up to €90m. Climate Action Minister Richard Bruton last night said the Cabinet had approved plans to buy allowances and credits from countries which would achieve their 2020 targets - but this will come at a cost. The final bill would depend on progress over the next two years, and taking into account emission reductions achieved during the recession. "During the recession, when output in the economy collapsed, Ireland was meeting its climate change targets," he said. "However, it is clear that we were only meeting our climate targets in those years because of the huge fall in output. "Once economic growth resumed, the growth in carbon resumed with it, highlighting the very significant structural issues which still exist within the economy in terms of reliance on carbon." Ireland had agreed to reduce emissions by 20pc below 2005 levels by 2020, but is likely to be just 1pc below. This means it has produced around 17 million tonnes more carbon than allowed. To comply, it will have to buy greenhouse gas emission allowances from countries which have achieved their targets at a cost of up to €13m. Analysis published by the Sustainable Energy Authority of Ireland suggests we will achieve between 12.7pc and 13.9pc of our 16pc renewable energy target by 2020 which in a "worst case" scenario will involved the purchase of renewable credits at a cost of some €90m or more. The State also risks being hit with fines by the European Commission. By November 7th it became obvious that the paper’s conclusions were wrong, as the GWPF highlighted in its press release. Two days later, the Ralph Keeling, co-author of the flawed ocean paper, acknowledged the errors and a few days later thanked Nic Lewis for “bringing an apparent anomaly in the trend calculation to our attention.” Shortly afterwards the Washington Post and numerous media outlets in the U.S. published about these new developments reflecting that. Rather than writing a new story about these major developments they eradicated the original story and simply overwrote it with a new text, using the same URL. They left it in the archive there with no mention what they had removed the old one, meaning that the original report no longer exists except via the wayback archive. 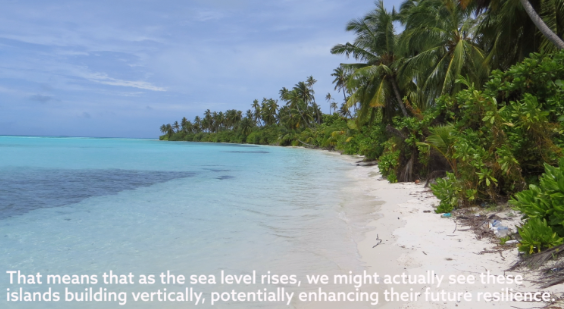 The paper Coral Reef Island Initiation and Development Under Higher Than Present Sea Levels is now available in Geophysical Research Letters. The Climate Change Act is ten years old. It was passed in a different age. David Cameron had been hugging huskies to de-toxify the Tories. It was a year before the Copenhagen Climate Conference. ‘Fifty days to set the course for the next 50 years,’ Gordon Brown declared. China and India’s veto put paid to that, but Britain is still lumbered with a law that puts huge economic power into the hands of an unaccountable body, the Committee on Climate Change, which entrenches climate policy unilateralism. However much greenhouse gases the rest of the world puts into the atmosphere, the Climate Change Act compels Britain to almost completely decarbonise. Jim Callaghan once told his policy chief Bernard Donoghue that the one thing he’d learnt from his years in politics was that when the two front benches agree, you can be sure they’re wrong. Snow fell gently from the sky as 465 MPs voted in favour of the third reading of the Climate Change Bill. Only five MPs voted against: Andrew Tyrie, punished by David Cameron with the chance of any frontbench job but now chairing the Competition and Markets Authority, Ann Widdecombe, Peter Lilley, Christopher Chope and Philip Davies. Looking back ten years on, the Climate Change Act is a threefold failure. It fails the national interest. The case for the Act assumed global action – Britain leads, the rest of the world follows. Of course that didn’t happen. According to the government’s cost benefit assessment, Britain would contribute nearly half of the total global benefit. Why do anything if you’re going to get very nearly half the benefit at zero cost? None of the cost benefit analysis accompanying the Act took into account Britain fully participating in the European Union’s Emissions Trading Scheme. Unless the EU’s emissions target changes in line with Britain’s, every tonne of carbon dioxide Britain is forced to cut because of the Climate Change Act enables other EU members to emit an extra tonne – all at Britain’s expense. That is to say, 100 per cent carbon leakage. The net effect on overall emissions is zero. There are no climate benefits from the Act – only costs. To Britain. If this sounds unnervingly similar to Theresa May’s Brexit, it is somewhat ironic that the backers of the Climate Change Act were and remain strong supporters of Britain’s EU membership. Yet when it came to the Climate Change Act, they were all afflicted by ‘fog-in-the-channel’ syndrome. They simply hadn’t taken account Britain’s participation in EU’s Emissions Trading Scheme. The impact assessment showed no such thing. Indeed, the assessment was absolutely clear this was not the case. ‘The benefits of UK action will be distributed across the globe,’ it categorically states. In fact there has not yet been any credible official study on the overall costs and benefits of global warming to Britain, which, it is plausible to believe, could benefit from some modest warming. Above all, the Climate Change Act is a moral failure. In the 2005 general election, the Labour party pledged to abolish fuel poverty. By 2015, fuel poverty was to have been a thing of the past. By the 2017 election, any thought of abolishing it had vanished. The impact of climate policies means that fuel poverty is here to stay. When he was energy and climate secretary, Ed Davey admitted that fuel poverty was not something that ‘can be eradicated in any meaningful way.’ Neither did he like the way fuel poverty was measured, complaining it was ‘unhelpful’ because it was too sensitive to rising energy costs. Something had to be done. So the definition of fuel poverty was changed. The focus was shifted from affordability to the potential to insulate properties. Overnight, the new measure nearly halved the number of households officially defined as living in fuel poverty. Cynical? The interests of the least well off were sacrificed to the powerful interests of the climate change lobby. The treatment of the economics provides the one glaring contrast with Brexit. The government’s whole negotiating position on Brexit has been driven by maintaining frictionless trade and just-in-time supply chains for manufacturing industry. The Treasury produces forecasts predicting an economic Armageddon if these are in the slightest way interrupted. But when it comes to decarbonising the economy, the government is entirely indifferent to the impact on economic competitiveness. If decarbonisation is so good for the economy, why is the European Union insisting on maintaining the so-called level playing field and requiring Britain write its decarbonisation commitments into a future trade agreement with the EU? If the government genuinely wanted to improve competitiveness, raise living standards and abolish fuel poverty, there is a straightforward way. It could repeal, or at the very least, amend the Climate Change Act and remove its blind unilateralism. This is still something that, for the time being, it doesn’t need the EU’s permission to do. But don’t hold your breath. Rupert Darwall is author of The Climate Change Act at Ten: History’s Most Expensive Virtue Signal published by the GWPF. On a sunny October morning, members of the The Geological Society pack an ornate lecture theater at their imposing headquarters on London’s Piccadilly. One of their number introduces a scientist who “needs no introduction,” the man people had come to see. Taking to the podium, Dr. Robert Trice, a lifelong rock obsessive who’s also chief executive officer of independent oil company Hurricane Energy Plc, adjusts his glasses and shakes his mop of pale hair. Then he explains his billion-dollar idea. From inside a ship, sloshing around the 65-foot waves off the coast of the Scottish isles, he plans to poke a diamond-tipped drill-bit into the sea bed. He’ll take it past layers of once-oil-soaked sandstone rocks straight into a strata of solid granite — what geologists call the basement. Then the drill will turn sideways and hopefully intersect a bunch of naturally formed cracks. If his science is correct, there will be enough oil pooled in those cracks to make him a very rich man. Mitchell started experimenting with the idea of hydraulic fracturing, or “fracking,” into shale rock in the 1980s. It took thousands of wells and 30 years for the American oil industry to widely adopt the practices he pioneered. When it did, the U.S. became the largest fossil fuel producer on the planet, permanently altering the global energy trade. Mitchell died in 2013 at 94 with a $2 billion fortune. We’re about to get a clearer picture of how well it will work. A floating production vessel specially modified for harsh conditions is now sailing through the English Channel to the North Sea. In the first half of 2019, Hurricane plans to use it to produce from two wells. The test of a good result? 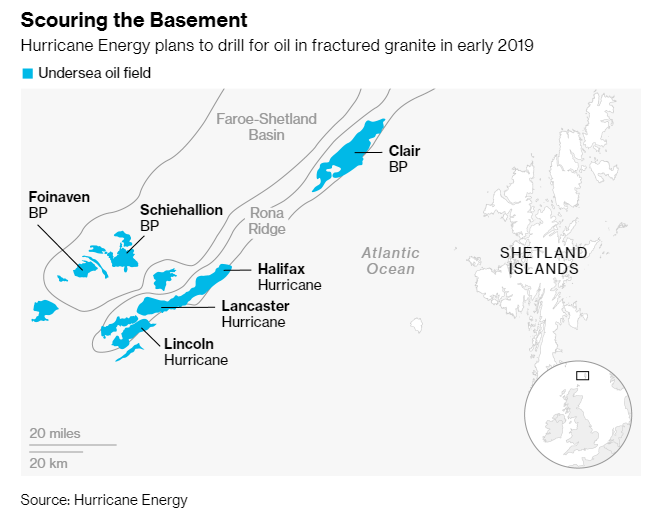 Hurricane needs the pressure underground to stay as high as Trice’s models predict, showing the cracks in the granite are interlinked and the pooled crude can flow freely to the surface for a sustained period. A report commissioned by Hurricane concludes one of its fields, called Lancaster, likely has half a billion barrels of recoverable oil. That’s worth almost $33 billion at $65 a barrel Brent crude, much of which would go to the British government in taxes. Hurricane is also exploring another two fields thought to hold billions of barrels more.